When I did the First Design of this project I used a 3 Terminal "2N5777". But the 2 Pin Version is the same, just without that adjustment. Additionally some persons have had troubles in getting the Relay to work. as the Relay. And its Cheaper. I really can't Say, But I have now ran one for over 3 Months, Day and Night. It shows No sign of giving up. It Still works perfectly. Here is the Revised Design. Also, I Can NOW Supply the 2N5777. 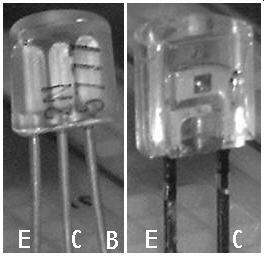 This is the Origional, General Electric, 3 Terminal 2N5777 Photo Transistor. This Alarm can be used to protect your property, Inside or Outside. And it can protect a Very Large area such as the complete perimeter of your yard. No Alarm System is Perfect. intruders in Different area's, Making a More Refined System. are visable light, setup is easy as you can see where to aim the Laser beam. 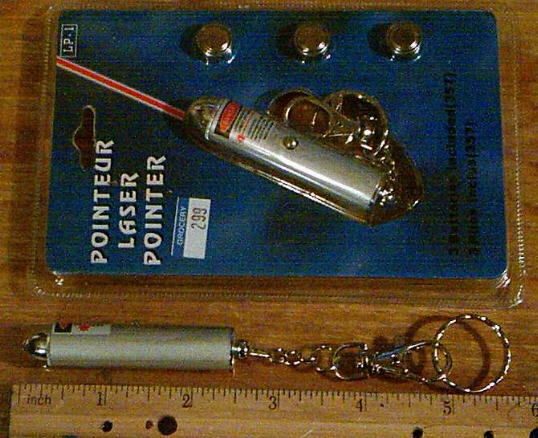 These Laser Pointers typically run on 3 small Button Batteries. Not a very practical power source, But almost any adapter will run them. "IF YOU PUT AN APPROPRIATE CURRENT LIMITING RESISTOR IN SERIES WITH IT". On the Laser I used, it requires About 40 mA. A New Resistor can be easily calculated. Using the formula below, A 225 ohm (220 Ohms, Close enough) resistor is suitable. At the Same Time, you will want to Remove or Bypass the Switch. through the laser beam, as well as a "Delay Reset" for the alarm sound. If Longer delays are required, a higher Value Capacitor in place of the 4.7 uF can be used. Or use Higher value potentiometers. If a Very Short Delay is Preferred, Reduce this Capacitor to a .1uF. The Reciever Assembly is fairly simple. It consists of a Tube, about one inch diameter and 10 inches long. A small piece of glass is Placed in front of a tube, to Keep out Bugs, Birds and Mice. I attached this Tube to an opening in a small box, Containing the Photo Transistor. You May Just put it into the Tube. Also putting a Cheap Magnifying lens to Re-Focus the Laser Beam can be useful. I Didn't do this, But It would Increase Sensitivity. The Laser Beam gets Aimed at the Photo-Transistor thats attached to the reciever. Note that the inside of the Tube and Box MUST be painted BLACK, to Absorb Unwanted Light. divert the beam by 90 degrees. Use one mirror at each corner. 2) In the Non-Latching Circuit the Load should Not Exceed 200 mA. 2A) If this load is connected Supply to Pin 3, It will "Go ON", When the Beam is Broken. 2B) If this load is connected Ground to Pin 3, It will "Go OFF", When the Beam is Broken. Transistor that works in the Visible Light range of 630 to 680 nm should be fine. However Most Photo Transistors today are in the Ultra Violet range and Won't Work. "Click On the Titles Below. "GO BACK to My Projects Page." "Schematic for 3 Lead, 2N5777. "Schematic for 2 Lead, 2N5777. 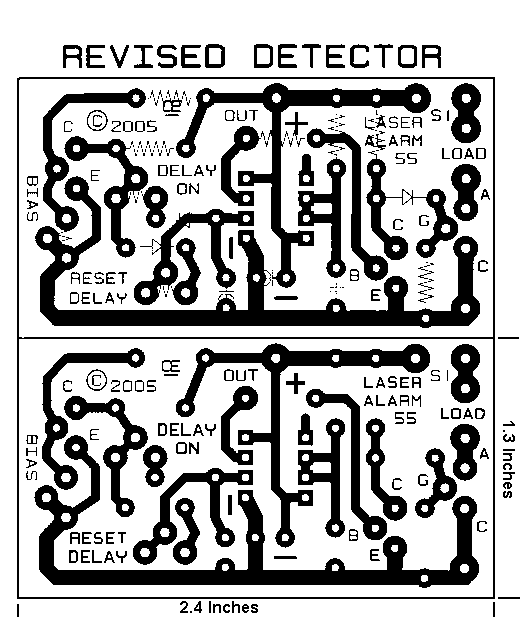 "The Cheap Laser Pen I Purchased for this Project"
"A Picture of the 2 Different 2N5777 Photo Transistor."